A hallmark of design in 2019 is integrating unexpected materials into familiar spaces. One trend we are excited to embrace is how designers are mixing metals in both home and office spaces. Brass, gold –and especially rose gold – have become popular staples when considering décor or furniture pieces. Read more to see how this trends pairs with Arclin decorative overlays for TFL, which provide interesting and attractive complements and/or contrasts to metallics. Warm metals are making a comeback, showing up in spaces in which stainless steel and chrome have dominated. They can bring to living and working environments a traditional, nostalgic ambience that may feel more inviting than cooler colors. Typically, brass has been presented in a highly polished finish, but burnished, matte, and un-lacquered pieces are popular now. Pieces such as lighting fixtures and cabinetry accents are being updated with clean lines and modern forms, making this traditional metal feel contemporary. From mantles to stove hoods to office accent pieces, brass is showing up in a variety of settings. Similarly, gold is being used in spaces from bedrooms to boardrooms. The metal’s glamour and reflective qualities make it a stunning vehicle for accent pieces, adding visual interest to any room. Gold also mixes well with other current design trends, serving as a contrast to bold, graphic styles and a complement to other organic backdrops and pieces. TFL sets the stage for these bold metals. Arclin’s new designs for our Harvest Collection offers outstanding choices to mix with brass and gold. The warm, natural look of Atlas Cedar blends perfectly with these metals. 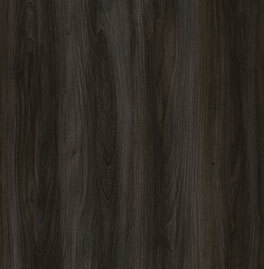 Or, create a stunning contrast with the cooler tones of Ionic Walnut. 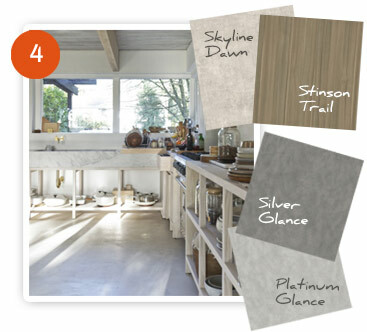 Designers may also want to capitalize on trends of mixing metals, using TFL’s metallic options to layer these colors. From smartphones to jewelry to car accessories, rose gold continues to enjoy popularity in contemporary design. Pink-toned, rich, yet neutral, rose gold communicates luxury without being overly extravagant. Not quite shiny, yet not quite muted, rose gold’s versatility is part of its draw. The metal is being incorporated into public spaces to create a sense of warmth and style, and into homes through pieces from furniture fabrics to wood finishes. Further, the popularity of rose gold has sparked interest in other pink-toned colors and muted metals. TFL designs are the perfect partner for rose gold, whether in home or commercial settings. Warmer options like Atlas Cedar (another addition to the new-for-2019 Harvest Collection) bring out the cozier, comforting aspects of rose gold. Or, create contrast with cooler options such as Charles Bridge. However you choose to incorporate TFL designs with metallic elements, rest assured that the durability and ease of maintenance of Arclin’s decorative overlays for TFL will keep your spaces looking beautiful. Contact Arclin for more design ideas, or with any questions you might have. Architects, specifiers, and designers have a lot on their plates. Not only do they need to be concerned with the functionality and logistical aspects of their works, they also need to think about style – including color schemes. Two of the most popular trends for the fall –terracotta/earth tones and monochromatic palettes – are excellent choices, offering the cutting edge of design while maintaining a classic look that can also bridge style trends. 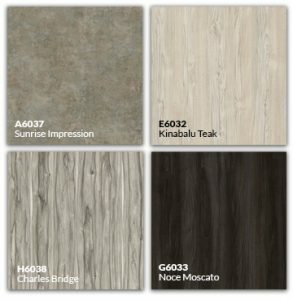 Arclin TFL is an ideal choice for those looking to satisfy customers’ desires for up-to-date styles, while offering long-lasting surfaces that can accommodate long-term use. Let’s take a look at the trends noted above and see how Arclin TFL helps realize these objectives. Warm, earthy color schemes are extremely popular, whether incorporated in Southwest-inspired design or brought into design themes through accessories. These color themes are generally regarded as calming, yet vibrant, lending themselves to spaces that seem, at once, stable but stimulating. Terracotta and earth tones are also great backdrops for splashes of color such as turquoise and other jewel tones, making them versatile enough to keep fresh by swapping out smaller decorative elements of design. Arclin TFL offers exceptional options in this theme. 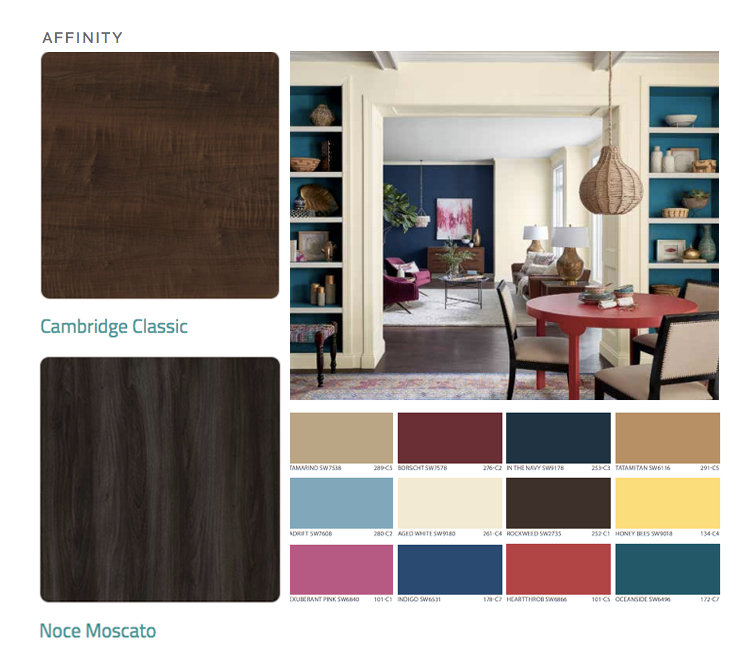 Selections such as Cognac and one of our new designs for 2019, Atlas Cedar, provide a strong but soothing red-orange feel complementary of terracotta, while Sandy Creek Maple and Caramel Patina offer a lighter, yet earthy feel. Minimal design is very popular, with commercial and residential spaces alike, adopting the “less is more” mantra. 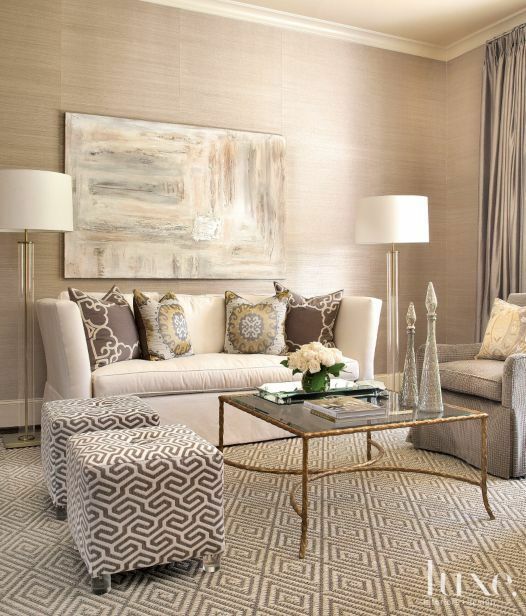 Monochromatic color schemes fit in perfectly – they are easy to create, but not lacking in style. 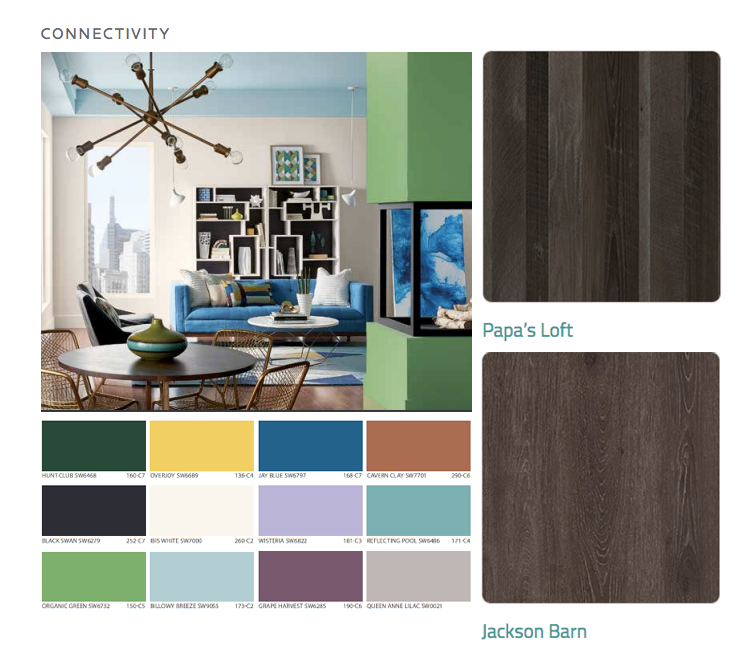 These palettes give commercial spaces a clean yet compelling look, and are a perfect way to highlight a small number of “impact” design elements. While monochromatic designs can represent any color, shades of white, gray, and silver are particularly popular. Arclin TFL designs such as Noce Blanc, and Brushed Metal are great starting points to explore this theme. Regardless of current trends, Arclin TFL’s timeless durability, environmentally friendly design, and high functionality means it will remain ready to serve. Visit our design page for more possibilities. Every industry has its “lingo” and it is no different when it comes to decorative overlays. If you’ve scrolled through the Arclin website and come across terms that have left you a little puzzled, don’t worry. Here are our top ten TFL terms we think you should know! 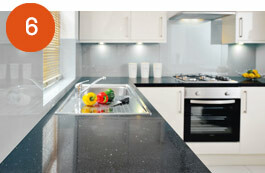 TFL – Thermally Fused Laminates. TFL is a durable, high-performing and consistent surface product that is less expensive than veneers and HPL (see below). TFL is made by fusing resin soaked decorative paper directly to a substrate. It is ideal for a wide variety of products and environments. 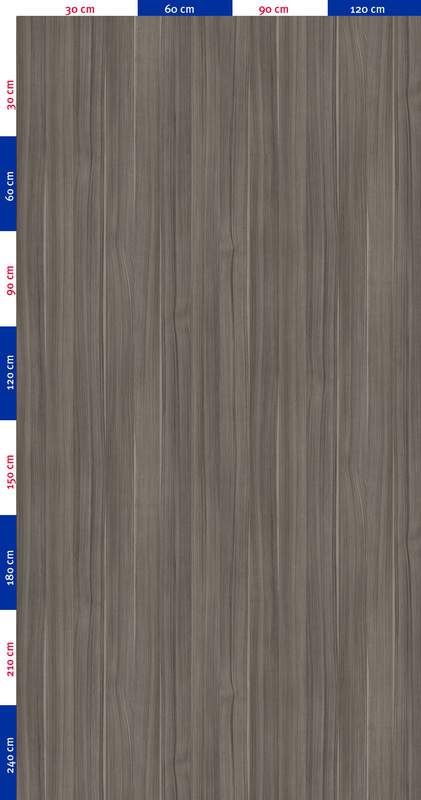 TFL also complements HPL, and the same or compatible designs are typically available in both laminates. 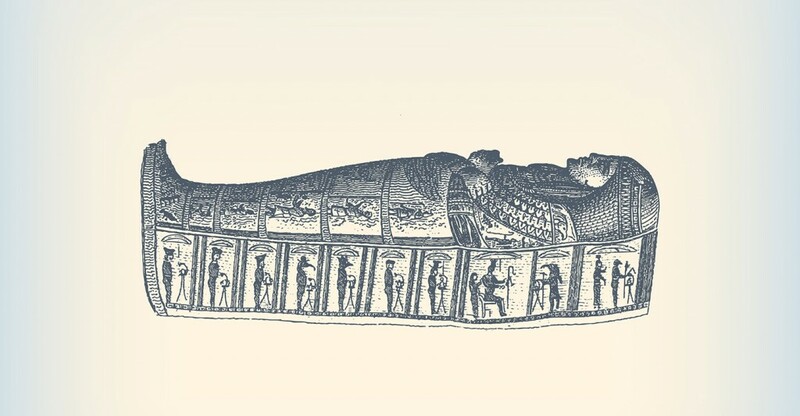 While veneers have been around since ancient Egyptian times, they certainly have come a long way. 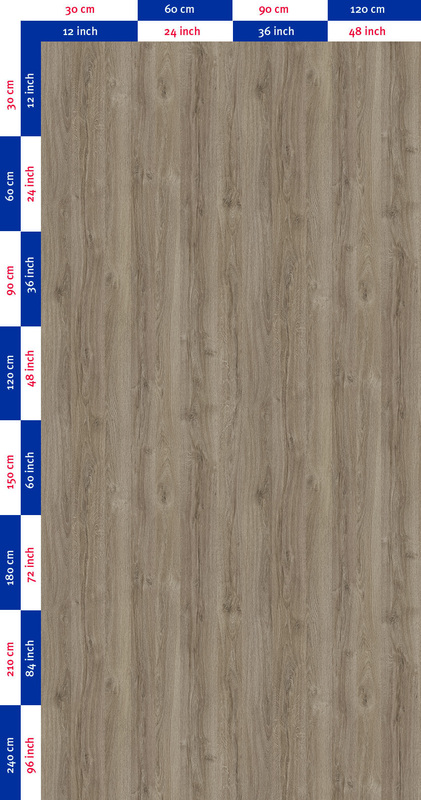 HPL – High Pressure Laminates. Similar to TFL, HPL also provide a durable surface overlay. However, HPL is traditionally used for extreme-traffic surfaces and are produced by saturating multiple layers of craft paper with phenolic resin. A layer of printed décor paper is placed on top of the multiple layers of kraft paper before pressing and fusing the paper with a substrate. Overlay – a covering for a material’s surface. TFL and HPL are examples of decorative overlays. Substrate – refers to an underlying material on which paper or other materials are applied. 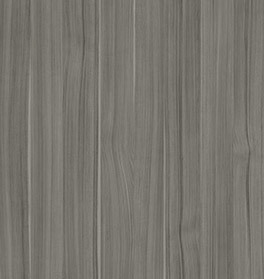 In the decorative overlays industry, we may classify particleboard or plywood as substrates. Thermoset – a material, commonly a resin or synthetic plastic, that hardens after the application of heat and pressure. Fidelity – the level of accuracy with which something is replicated. In the decorative overlays industry, this term may be used to describe how well TFL or other overlays mimic the look or texture of specific materials, like wood or marble. 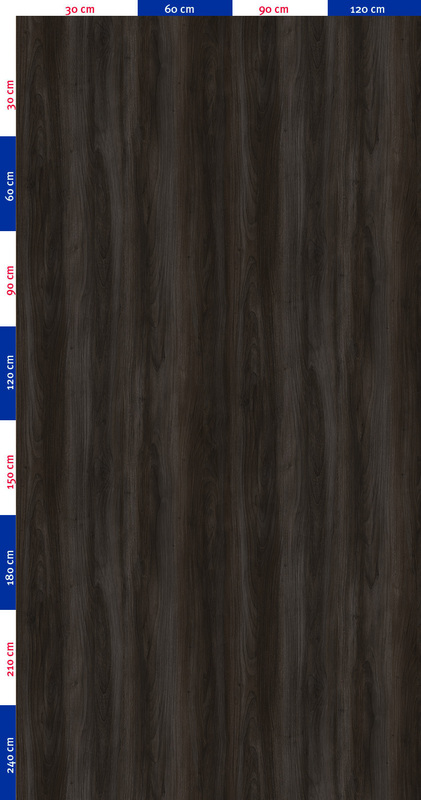 Veneer – a thin decorative layer of material applied to a substrate. Veneers can offer the look of highly sought after materials at a lower cost. Check out our post Alternative Building Materials That Create a Luxury Look Without a Luxe Price for a deeper look at this. Grain – the longitudinal arrangement or pattern of fibers in wood, paper, etc. 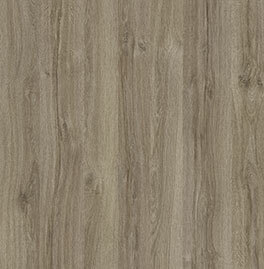 TFL, especially textured TFL, can mimic the look of real wood grains. Sustainable – conserving an ecological balance by avoiding depletion of natural resources. In construction, this means that steps have been taken to reduce the carbon footprint of the building or furniture while using materials that do not deplete natural resources. Low-Emission – Materials such as paint and adhesives contain volatile organic compounds, or VOCs. VOC’s unique properties allow the material to evaporate so paints dry and leave pigment behind, or adhesives dry and bond materials together. However, it is not recommended to be exposed to VOCs too often. Low-emission material, such as TFL, are designed to emit low or no VOCs — making for a very environmentally healthy application (also Shades of Green). Low-emission building material can help achieve LEED certification and are, in general, just healthier for the people around it! Are there other technical terms in the world of TFL? Post a comment with your questions on our Facebook page. As you certainly know by now, we’ve made significant changes to Arclin’s decorative overlays portfolio in the last two years. What drove our decisions? And why does (or should) it matter to you? Let’s start with the second question — that’s easy: The changes in our portfolio reflect design shifts across many of the application industries served heavily by TFL — kitchens, closets, retail, healthcare, hospitality, office and more. The 21 new papers (12 designs) in our new Harvest Collection were selected expressly to meet growing and future trends across multiple applications. How did we go about making our decisions on what to take out, what to add? We started by purging our portfolio of older designs that had worn out their welcome. We conducted extensive research on U.S. and worldwide trends, current and future, to find the best opportunities for our customers. (This is an ongoing effort!) Red and orange = out. Walnut, warm grays and browns, tone-on-tone and light colorations = in. Textures abound. We reviewed the entire portfolio by design structure, type of grain or other structural feature, color, application opportunities and more. We were admittedly far too heavy on the reds and oranges, light on some of the more modern features (see #2, above). 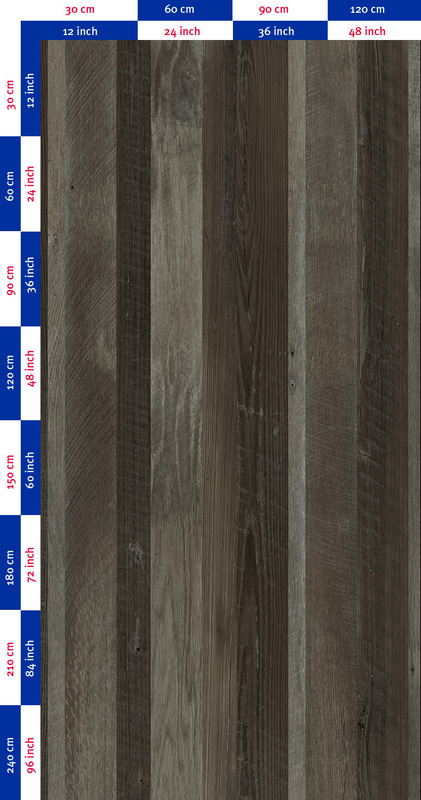 Alexandria Walnut – probably the most traditional of the new designs, the fidelity and rich coloration of this beautiful walnut make it anything but “old.” Equally at home in traditional structures or exotic applications. 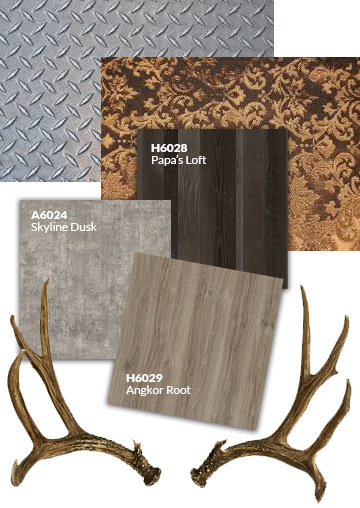 Angkor Stone & Angkor Root – rustic with a touch of elegance, with colorations that hit the trends but with slightly unique hues. These two are applicable virtually everywhere, from closets to cabinetry, hospital rooms to office settings. Cambridge Classic & Cambridge Bronze – we’ve always said about this one: you have to see the full panel to grasp the beauty of this one. Rich and regal, this one has the potential to carry the room. 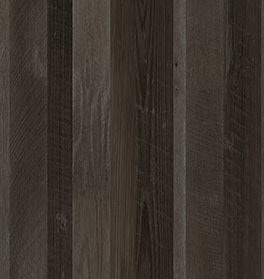 Charles Bridge – one of the more exotic designs in the collection, this seemingly in-motion wood grain has been colored for maximum dramatic effect. 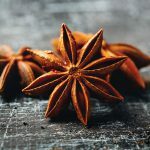 We can see this one at home in a modern kitchen (imagine the pairing possibilities), or in hospitality and retail settings. 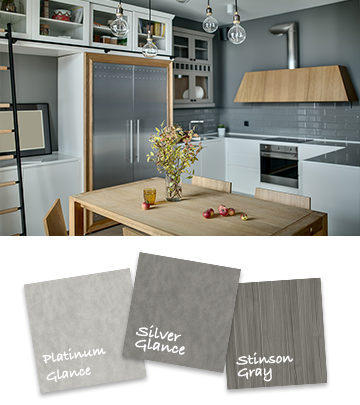 The Glances (Silver, Platinum, Lead) – a brushed metallic effect, we liked this one for its suitability for garage cabinetry, retail environments and more. 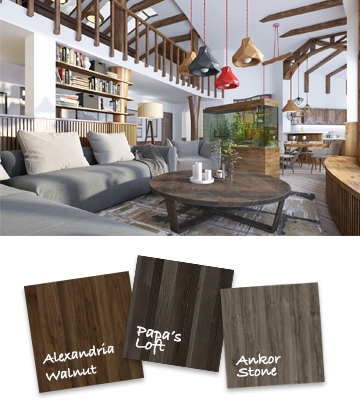 Jackson Barn & Jackson Buff – warm, rustic oak with a hint of on-trend cerusing, these meet the demand for high fidelity rustics — with a bit more flexibility than most. Kinabalu Teak – the midcentury modern resurgence brought teak back into vogue. Now the teak trend looks to have legs. We gave it extra traction, here, with a lighter, almost tone-on-tone coloration. There’s really no limit to the application possibilities here. Noce Moscato – rich grays, browns and blacks made this one an easy pick. Gorgeous, dramatic and a design-driver in the spaces it inhabits. 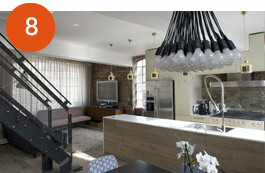 Papa’s Loft – the most popular of the collection, so far, this design proves that TFL isn’t what it used to be. That is, with improvements over the years in performance and fidelity, we can bring fresh designs to life that expand our opportunities to replace traditional veneers and other surfaces. We focused the coloration, too, on current and sustainable trends. 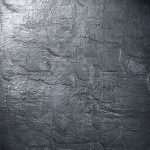 Skyline Dawn, Dusk & Dark – conjuring concrete or stone…even a metallic as you evolve to the darkest shade…this design was selected from among dozens of concrete-based textures we considered. Absolutely on-trend and in high demand. 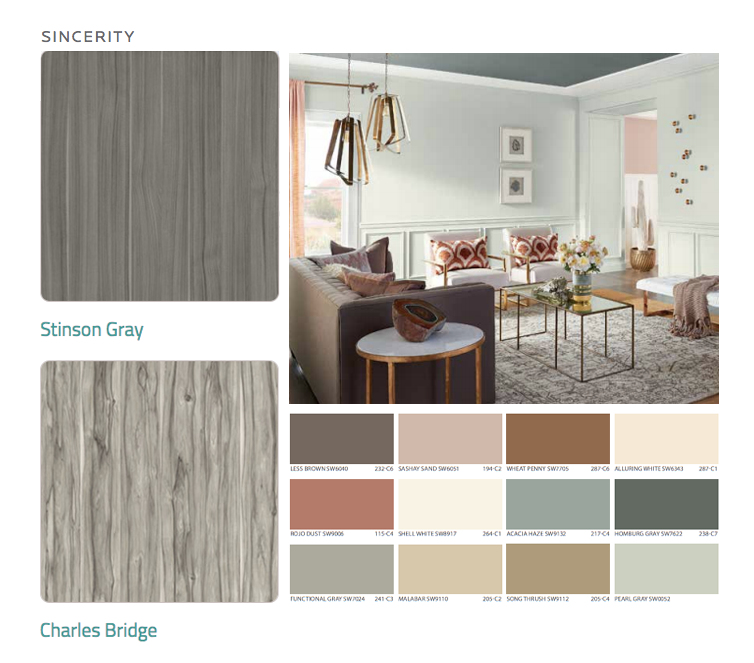 Stinsons: Gray, Trail & Umber – this design captured three aspects we were looking for in our new collection: a modern lineal, on-trend colorations and extremely versatile. Sunrise Impression – stone? marble? concrete? We’ll leave it to your impression. Which is what makes it so appealing. Get in touch for samples, pricing information and more. Tiny homes have been gaining momentum for some time now, thanks to shifting consumer tastes and no less than three different shows on HGTV that are aimed at reversing the bigger is better mentality. (Yes, Tiny House, Big Living; Tiny House Builders; and Tiny House Hunters all exist.) Now the microdesign trend is coming to commercial architecture. First up: hospitals and hotels. Called microhospitals and microhotels, these new iterations are smaller, more intimate, emphasize shared space over individual rooms, better integrate technology, and are more thoughtfully constructed to avoid less waste. This means design needs to be smartly executed to make use of available square footage. Storage space, furniture, and even rooms serve multiple purposes. And having the right construction materials is critical to making that possible. Microhospitals are becoming especially popular in markets where patients do not have easy access to emergency care. That can be in a busy urban area with long ER wait times or a small city that would not be able to support a full-scale facility. It is such a hot topic in hospital construction that Becker’s Hospital Review rated the “microhospital” as the number one design trend to expect in 2017. It’s true that urgent care centers have been on the rise in recent years, but a microhospital is different. 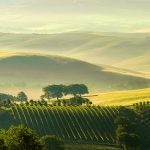 It is an always-available, full-service operation but typically maxes out at 50,000 square feet and are meant for short stays. They have a lower construction cost than a traditional hospital, ranging from $7 million to $30 million to build. And since they are smaller, they take less time to build, which allows the health system to bring healthcare services to communities quicker. These are attractive features to both builders and the cities the microhospitals will serve. 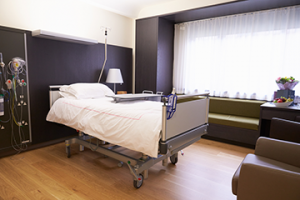 In addition to creative use of space, TFL is a popular surface choice in microhospitals due to its stain, germ, and abrasion resistance. It is also easy to maintain, which makes the environment healthier and safer. 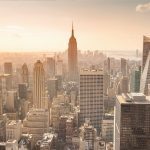 When it comes to hotels, it is no surprise the trend first popped up in cities with expensive real estate like New York City and Tokyo. 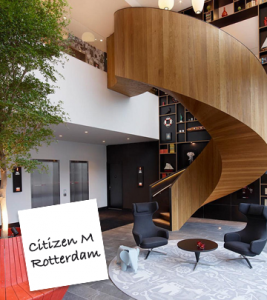 And recently, several hotel chains have emerged to capitalize on the trend, including Pod, Yotel, and CitizenM. There are many reasons to embrace microhotels. They put much more emphasis on communal spaces, such as lobbies, lounges, and office centers. Design is critical to appeal to its main audience: Millennials. The idea is that this price-sensitive audience is more interested in “just having a place to sleep.” So, unlike the downsizing of airline seats, microhotels actually emphasize comfort and quality. It should look good, be environmentally-conscious, and have character. These are some of the reasons TFL is showing up as a popular surface material in microhotels. 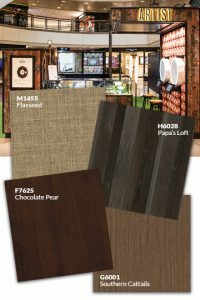 TFL offers contemporary woodgrains and colors, with exact matches in other complementary materials. It is also a favorite “green” surface material with low-to-no emissions. And while size is not, aesthetics are emphasized in microhotels. Microhotel designs provide creature comforts: multiple USB plugs, modular furniture, and adequate storage space. And with all that floor space trimmed away, they tend to charge less per night so who wouldn’t be happy with that? Whether for an overnight hospital stay or a week away, expect to see more architects thinking small. 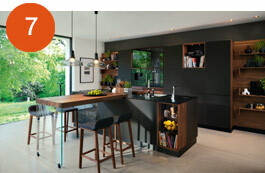 We’ve highlighted some of our newest kitchen designs to show off the versatility of the trends! Like a lot of you, we just got back from the Kitchen & Bath Show in Orlando, one of the many places we go to stay on top of design and surface trends. 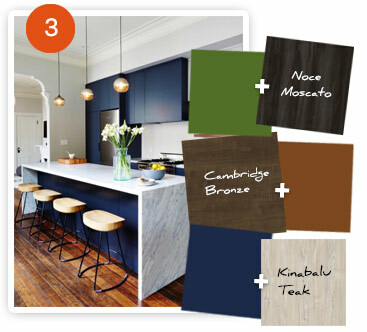 Here are our Top 8 trends we’re seeing in kitchen design. What strikes your fancy? Marble with reclaimed or rustic woods, modern mixed with retro, classic designs matched with bold, fresh colors and textures. Wood on wood. Concrete with anything. 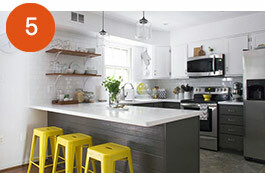 Kitchen design is more flexible, more eclectic, more dynamic than ever. This combo never goes out of style. 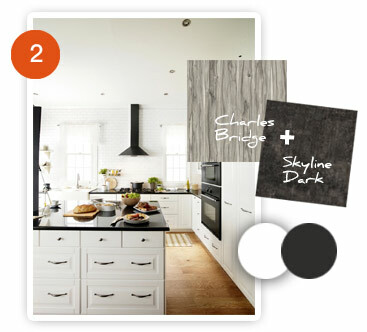 In kitchens, we’re seeing a shift from all white (which we still love, by the way) to white plus…a little drama. Black pops against white cabinets and walls. White counters over black cabinets…stunning. A chartreuse sink? Blue cabinets? Why not! Pantone’s 2017 color of the year, Greenery, is a great example of color bringing energy to warm wood tones or simple whites. We’re also seeing a lot of blue. Which is beautiful matched with gray grains, light warm woods and yes, white. Above and below, we see more designs dispensing with the cabinet doors. That means more attention paid to shelving materials. We saw grays start to take prominence in kitchens several years ago — and it’s a trend that doesn’t seem to be fading anytime fast. 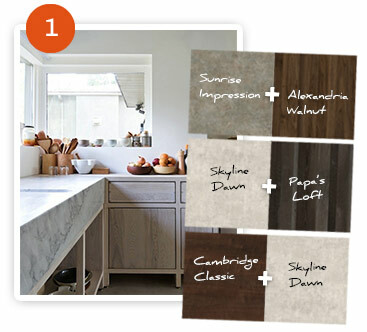 Just look at our options — there’s so much to choose from, so many kitchen design directions to go. Some designers are starting to express their weariness with this sustaining trend, which has taken over restaurants, retail, offices and hospitality over the last decade+. But now we’re seeing it take on a new life in kitchens and more. 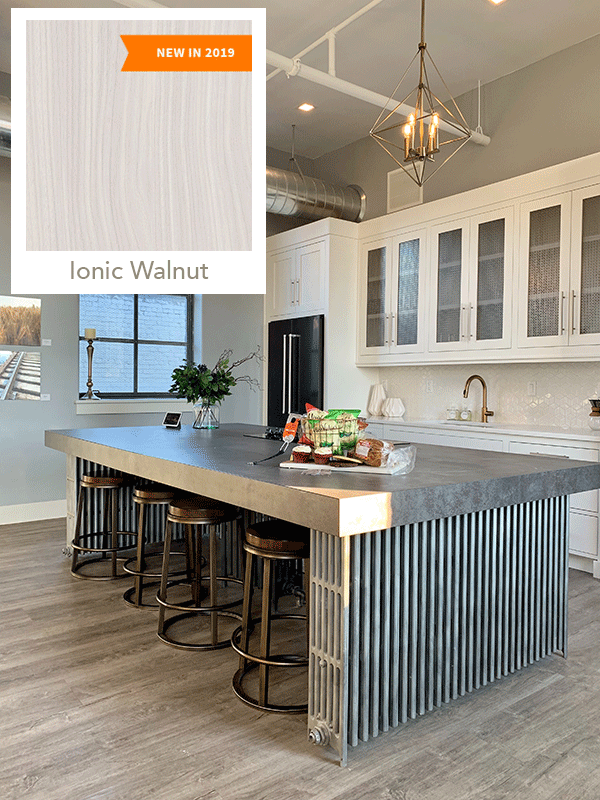 Much as rustic has become more sophisticated, industrial kitchens are featuring more advanced engineered surfaces as a showcase for modern industrialism. As we’re seeing, frankly… everywhere. Once popular during the Art Deco era, “cerusing” — accenting grains for contrast — creates an elegant look in any kitchen style, whether rustic, modern or a combination of the two. The Midtown Harvest Collection takes us from uptown to Main Street, urban sophistication to hometown warmth. The names reflect their Americana inspirations. Cambridge Classic & Cambridge Bronze – regal, rich, hand-hewn, historic. 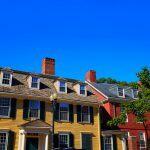 That took us to one of the country’s most historic and regal cities: Boston. 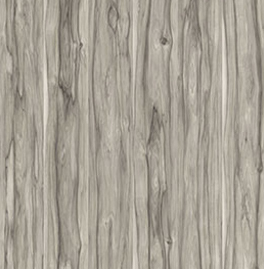 We imagined these designs on the rich wood walls of Harvard Library in Cambridge. 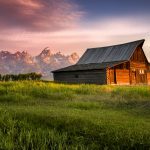 Jackson Buff & Jackson Barn — these rustic designs conjured old world charm to us…visually transporting us to picturesque Jackson, Wyoming. And a name was born. 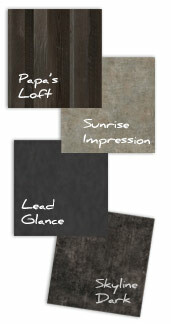 Papa’s Loft – rustic, sea-weathered reclaimed barn wood, with more than a touch of gray. 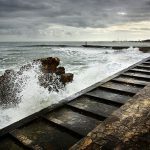 Think Old Man & The Sea…and author, Hemingway whose nickname was, in fact, Papa. Skyline Dawn, Skyline Dusk, Skyline Dark – this concrete-finish structure brought to mind urban settings and tall buildings…and the way city colors change as the daylight progresses. Stinson Gray, Stinson Trail, Stinson Umber – cool to warm, lineal, earthy. 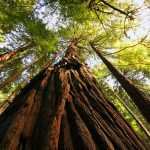 We thought of the trails to Stinson Beach in Muir Woods National Forest — full of tall straight trees and sandy trails. Designs culled from global influences and a diversity of textures, colors and surface. Alexandria Walnut – The Port of Alexandria in Egypt was the world’s first and largest trading post for spices. And this is one spicy walnut. Angkor Stone & Angkor Root – exotic, old world and textured, the structure and colors of this design evoked, for us, the ancient Cambodian temples. 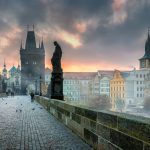 Charles Bridge – we see water, winter, movement, drama. The picturesque Charles Bridge in Prague is…all that. Platinum Glance, Silver Glance, Lead Glance – this metallic, patterned abstract plays to the interlocking crystals of the galena ore. Also called “lead glance,” galena is a leading source of silver. You do the math. 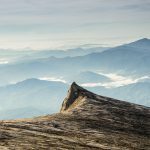 Kinabalu Teak – subtle cracks, knots and wide grains follow the terrain of Malaysia’s first national park. Noce Moscato – Noce = Walnut, Moscato = an Italian sparkling wine. There’s almost an aroma to this one. 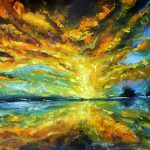 Sunrise Impression – you might see stone…marble…concrete…or even an impressionist painting. Monet’s first impressionist painting — which actually sparked use of the word “impressionism” — was called Impression, Soleil Levant or…Impression, Sunrise. Granted, we’re all in business to sell our products. That said, Arclin’s overarching strategy with our Reinventing TFL marketing effort is to support the entire value chain — not just ourselves — through education on TFL and other surfacing options. What product, what place, to what advantage. Our aim is to grow the industry by bringing more people to the table for all of us. To that end, we’re going to continue to use our social media channels to try to reach downstream — to architects, interior designers and specifiers who present our greatest opportunities for market growth and who are, too, heavy users of social media for information, inspiration and idea-gathering. Our Facebook page plays on our theme but with a market-focused twist: Reinventing Surfaces. We’ll continue to build Instagram and Pinterest galleries that inspire but also educate our followers. Our blog will continue to become a repository for telling different parts of the TFL and surfacing story. Our content is yours to share. And if there are subjects you’d like us to cover, please let us know! Yet another trends list?? Well…yes. Because we haven’t seen one that covers our unique niche. We’re taking a look at decorative surfacing trends for the hospitality industry — what we’re seeing on furniture, fixtures, walls and more at restaurants and hotels across the country. We’re excited to see where things are headed in hospitality design. Because, truth is, they’re headed in a number of different directions. Which makes it all kinds of fun for those of us who get to pick the surface designs to offer up to the industry. We see lots of variety, imaginative spaces and a continued push toward ever greater design complexity and sophistication. 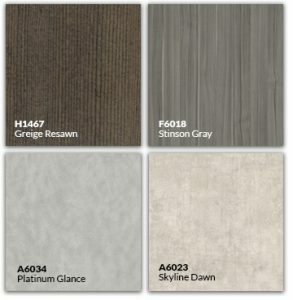 Sure, many of the examples we give here are our products, but the trends apply to the whole spectrum of surfacing options. I had a designer tell me just last week that she was “so over” industrial chic. I could see that only if you limited the options to a moment in time. 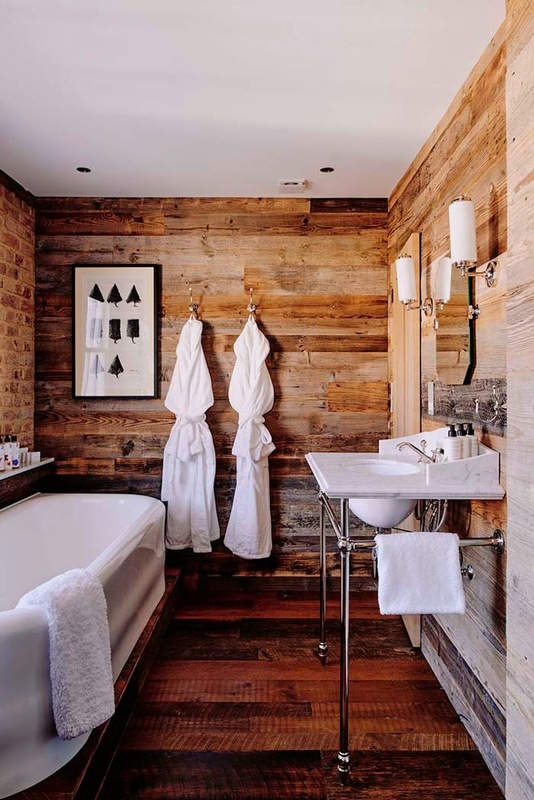 But restaurants and hotels are continuing to claim forgotten spaces and creating their own “raw” interiors that combine repurposed elements and pure, rustic themes. The staying power is in the warmth of the environments, the smart use of resources, and the enormous variety of design possibilities. The trend continues to evolve as designers get more and more creative. From a materials standpoint, the options are seemingly endless! Decorative surfaces are heeding the call, with highly realistic designs that capture the spirit without sacrificing the barn, so to speak — or the budget. Our recently introduced Papa’s Loft design for TFL is a prime example. Reclaimed, weathered and perfect for everything from counter faces to headboards to architectural walls. Or check out Jackson Barn and Jackson Buff. The concrete-inspired Skyline series of Skyline Dawn, Skyline Dusk and Skyline Dark is turning heads, too. Call it Hollywood glamour or the New Elegance, rich, sophisticated interiors have made a comeback. Lush fabrics and ballgown-worthy interiors are made all the more vibrant with surfaces that embody the intensity of the space. Arclin’s Cambridge Classic design evokes hand-hewn surfaces you might’ve found in, say, an estate library a century ago. What might’ve once been called “transitional” design — a blend of old and new — is now taking on new life as modern interiors are infused with a variety of styles, interpretations, materials and inspiration. Imagine paring this fresh Stinson Trail design with an animal patterned fabric or a nature-themed interior (it does take its name from a path through Muir Woods to Stinson Beach!). At the same time, Cambridge Bronze transitions well from classic to contemporary when you use its bold features to make a statement. Lines aren’t so clearly drawn anymore, which gives us a lot of freedom to reimagine spaces. Bohemian, Mediterranean, Italianate, French Provincial…we’ve long experienced their style inspirations in the environments we frequent. Designers are now combining styles and materials in single interiors to evoke a sense of worldly adventure. Can’t imagine how a simple surface structure could contribute? Think again. Jackson Barn and Jackson Buff took us mentally to vast prairies and towering mountains. 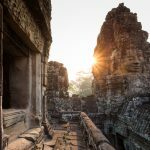 We’re introducing an entire globally-inspired selection of designs later this year, with designs that conjure thoughts of Cambodian temples, Middle Eastern ports of call and fog-enshrouded bridges. One of the things we’ve always loved about creating designs for decorative surfaces is that we’re not bound by the same laws of nature that define solid woods, veneers or stone. If you can imagine it, we can create it. Concrete textures with a hint of woodgrain. The feeling of wide planks that aren’t really planks at all. A color play that can turn an abstract neutral into a sleek metallic. The ability to craft surfaces from virtually any material we can get our hands on, “playing” until we get just the right look. Hospitality spaces work hard to create experiences, to comfort and to inspire. Decorative surfaces can be the perfect solution when the creative sky is the limit. 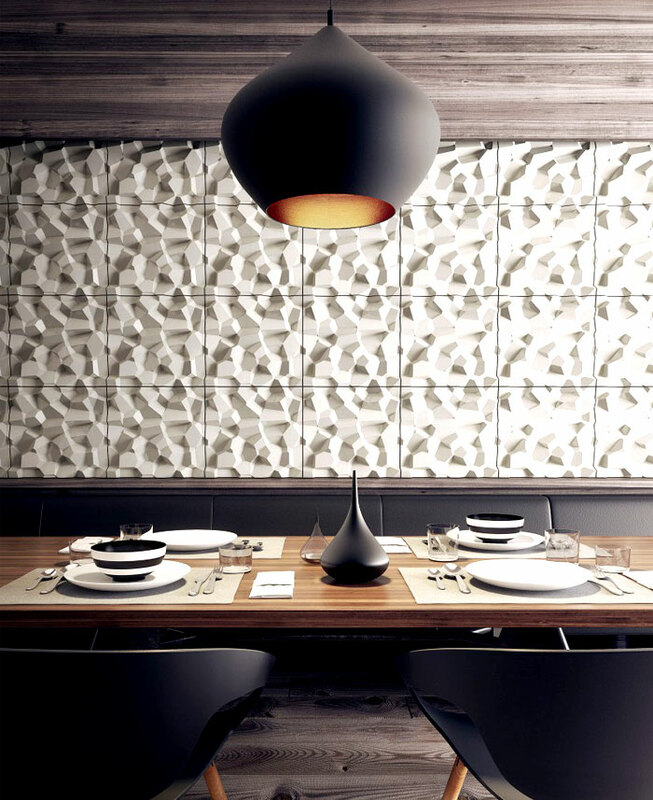 What surfacing trends are you seeing in your commercial and residential design? Share with us on Facebook. The U.S. creative team at Interprint worked with Arclin and Roseburg to identify the designs for this addition, selecting these four for that met multiple criteria for design and functionality. They include Calm Horizon, Ruby Beach, Sand Shoal, and Southern Cattails. Decorative surfaces have been around since the ancient Egyptians began using wood veneers to coat their furniture and sarcophagi. They’ve come a long way. Today, the market offers a variety of decorative surface options (there’s a good primer here), from veneers to High Pressure Laminates (HPL), from foils to perhaps one of the most overlooked and high performing surfaces available: Thermally Fused Laminates, or TFL. Every surface option has a distinct sweet spot — that is, uses and applications for which it’s most appropriate and effective. Here’s a quick summary of the properties and benefits of TFL. And a thing or two you might not have known about this advanced surface option that is quickly growing in popularity. For the right applications, TFL is high performing at a lower cost than many of its sister products. 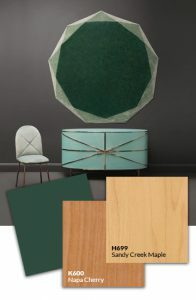 Resin-coated papers are thermoset, under high heat and pressure, directly to a substrate (typically particleboard, plywood or MDF), which eliminates the need for multiple layers of base paper and creates a very uniform, strong surface — at a lower production cost than many other options. TFL is just as design-forward as HPL has become, matching the graphic intensity and fidelity of woods, stone, metals, abstracts and more. Advancements in design and printing technologies and expanding market interests have driven TFL manufacturers to create increasingly realistic, beautiful and varied decors. Advanced laminating technologies have made textures possible, as well, adding yet another dimension to TFL’s life-like design properties. TFL is an environmentally friendly alternative to solid woods and veneers. TFL uses paper derived from sustainably harvested sources. And through sophisticated design, TFL can realistically mimic the look and, increasingly, even the feel of any wood or abstract material without depleting valuable natural resources. Arclin TFL can contribute to LEED credits for improved indoor air quality and is manufactured in FSC chain of custody-certified facilities. TFL’s consistency and durability makes it ideal for a wide variety of industries and applications. Decorative surfaces are used in industries including Residential, Retail, Healthcare, Office, Education, Government and more. Applications: Cabinets, Furniture, Closets, Desks, Architectural Features and more.